My grandmother was passionate about Ginger, On the sideboard in the dining room, there stood, on a saucer, surrounded by long tined pickle forks, a blue and white Chinese Ginger jar full of lumps of candied ginger. After a meal, she would go over, poke about in the jar with a fork ad extract a large lump of ginger. She would pop it in her mouth and chew away with tears streaming down her face. She loved Ginger Liqueur too and was not averse to a glass after dinner. At times she would mix it with swirls of lemon peel, ginger ale and ice and call it a Horse’s neck with a kick. I later discovered that this was a genuine American cocktail. You’ll need : 6 egg whites, pinch cream of tartar, 300g castor sugar, splash of Champagne Vinegar [or mild white wine vinegar], 1 vanilla pod, 30g corn flour. Method : Preset the oven at 120C. Whisk the egg whites in an electric beater till they form soft peaks. Add the sugar, vinegar, the seeds from the vanilla pod and the corn flour and mix for a further minute. Spoon four large egg shapes onto non stick baking. Bake in the preset oven for about 40 minutes until the outside is crispy and the centre is still soft. Leave to cool completely. When cool these can be stored for a short while – a day or so – in an air tight container. You will need two meringues per serving. 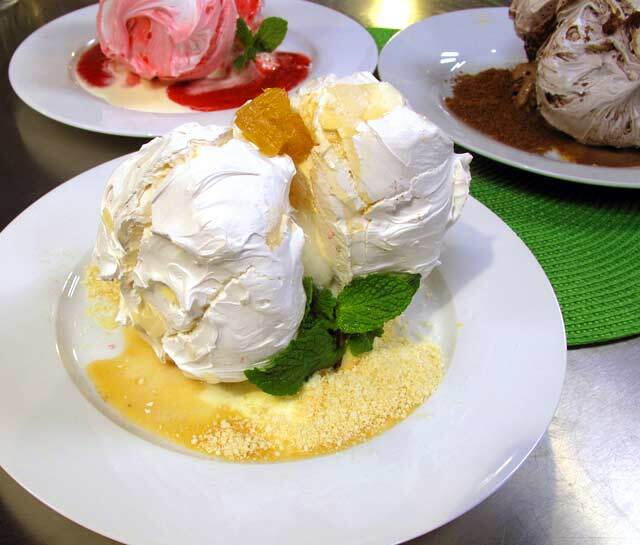 For Vanilla and Ginger Meringues, which I made on the Expresso Breakfast TV Show, you will need Vanilla Ice Cream and Oudemeester Ginger Liqueur. You’ll need: preserved Ginger – cut into strips, Oudemeester Ginger Liqueur and crumbs of vanilla wafer biscuits, fresh mint for garnish. Place two balls of vanilla ice cream on a plate and wedge a vanilla meringue on either side. Place strips of ginger preserve on the ice cream and drizzle over a little syrup from the ginger jar and the liqueur. Garnish with mint and strew some of the vanilla wafer crumbs on the plate.